The ‘Pet Friendly’ village has been established for the Over 50’s who prefer to live in a secure, peaceful and relaxing environment. This manufactured home comprises of two bedrooms; master with mirror-door robe and ceiling fan. 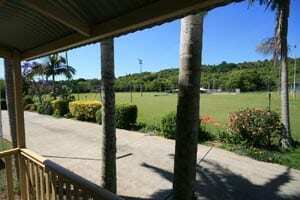 The covered front verandah has views over the local sports ground to the rolling hills of Terranora. The home has an open plan lounge and kitchen with a high raked ceiling. A two-way bathroom, covered entrance porch, external laundry, new gas water heating service and reverse cycle air-conditioning and a new carport adjoins the side of the home.